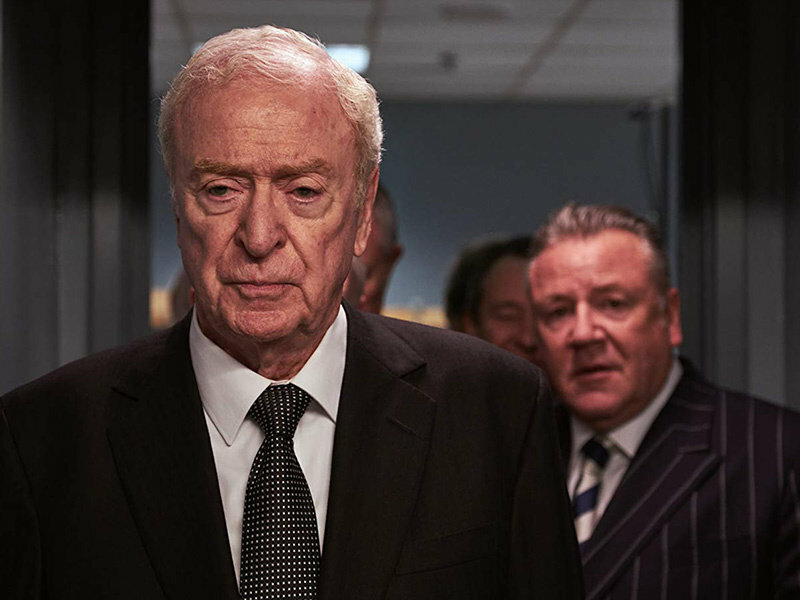 James Marsh reflects on embracing the truth in spite of its vulgarity and awkwardnesses to tell a dramatised factual account of the Hatton Garden diamond heist in his film, King of Thieves. 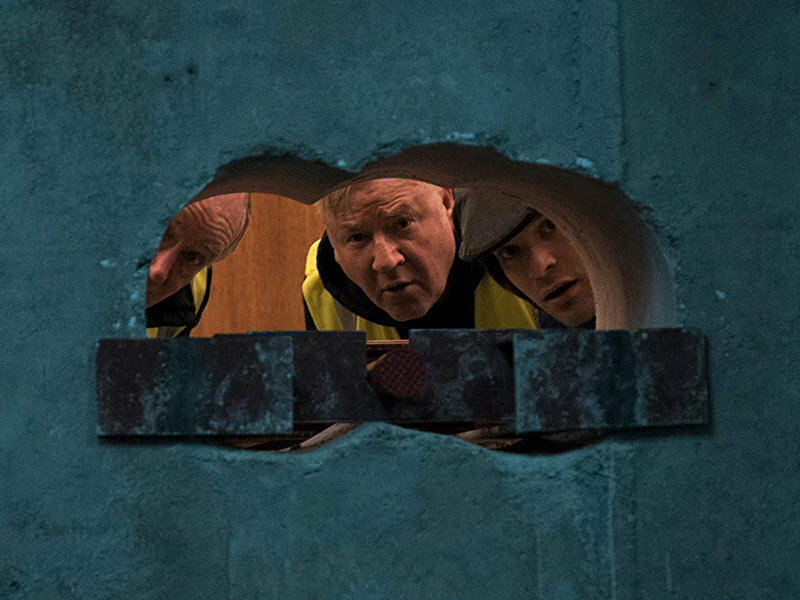 King of Thieves (2018) tells the true story of the 2015 Hatton Garden diamond heist, estimated to total £14 million in stolen loot. Behind this crime were a crew of retired elderly crooks, whose daring and successful heist was thwarted by their greed and infighting. Played here by a cast of well known British actors including: Michael Caine, Jim Broadbent, Tom Courtenay, Paul Whitehouse, Michael Gambon, Ray Winstone and Charlie Cox, it's a true story that has an inescapable fictitious air about it. Marsh's career has been a movement between documentary and narrative fiction. In Wisconsin Death Trip (1999), based on Michael Lesy's book (Pantheon, 1973), there's a fusing together of the two. Dramatising true events that occurred between 1890 and 1900 in Black River Falls, the director explored the unexplained malaise that saw the town's population inflicted with supernatural paranoia, madness and violent acts of murder and suicide. Later, with Project Nim (2011), he would investigate the 1970s case of a chimpanzee separated from its mother at birth and raised as a human child. Marsh's other documentaries included an episode of BBC Four's Arena titled Blondes: Jayne Mansfield (1999) and Man on Wire (2008). His narrative features Shadow Dancer (2012) set amidst The Troubles in Northern Ireland, and the stories of Stephen Hawking in The Theory of Everything (2014), and amateur sailor Donald Crowhurst in The Mercy (2018), have seen his narrative work remained entrenched in fact. In conversation with PopMatters, Marsh discusses the relationship between the documentary and narrative fiction forms, how point of view forges sympathy with a moral conflict, as well the King of Thieves as an unusual pleasure. Why film as a means of creative expression? Was there an inspirational or defining moment for you? There was this growing realisation that I was infatuated with films as a child, and I felt so strongly about them that I thought they were real, in a way that a child does. As I got a bit older I began to think: Well maybe I could do this. And you also see certain films when you are an impressionable teenager that really change your life in certain ways, or nudge you in the way you think about things. Then you understand the enormous power of the medium as a way of telling stories, of conveying ideas and most of all landing emotions. Like most filmmakers I'm sure it's a love of the medium and then a presumption that you might be able to do it, and so that's how it came about. But my background is documentary films, which is obviously different from what I am doing at the moment. There was a time when narrative features and documentaries were discussed independently of one another. Documentary films in recent years have taken on a cinematic quality, indicating that the integrity of the form can be preserved whilst taking inspiration from narrative cinema. Yet you could assert that narrative filmmaking is influenced by documentary – looking to life as a basis for drama, and informing of real life events. This is a visceral meeting point in the cinema between the objective and the subjective, fact and the representation of fact. What are your thoughts on how the two forms influence one another, while not sacrificing their integrity or intentions? Well I suspect they always have, and one of my favourite documentaries is Le Sang des bêtes (1949), by Georges Franju. It's a really strange documentary set in an abattoir in post-war Paris, and it has so many unbelievably strange images in it. And then Franju goes on to make horror movies, and very brilliant ones too. But to try to answer your question, which is a big one, when I was mentioning formative experiences as a viewer, Errol Morris's film The Thin Blue Line (1988) was the first time I thought: Oh my God, you can actually make cinema out of it. I was young and naïve at the time and seeing that film, the score, its visuals, and the fact it was so confident that he was able to do something really complicated with points of view, while not disclosing a definitive truth. Then, when you think about Rashomon (Akira Kurosawa, 1950) as a film that did this in Japanese cinema thirty or forty years beforehand, there has always been a dialogue between the two forms of expression. But I guess your point may be that in the twenty first century, the cinema documentary has found a real niche, with the right kind of story. I've made a couple of films like that... which I designed for the cinema and hoped that would be the first point of consumption -- Man on Wire being the first, or Wisconsin Death Trip going back to an earlier film I made, which was a weird hybrid between drama and documentary. So I think they've always informed each other, and it's a process in terms of how you shoot a film, the style of it, and I guess the manner of the storytelling, the short cuts you can make, which you can also do in documentary. So it's an ongoing dialogue from the get go and quite a few of the great filmmakers, including Scorsese, has made great documentaries, as well as great feature films. Buñuel has made documentaries and has made great feature films, so there's quite a few practitioners who are accomplished in both forms, and Wim Wenders is another one. You imagine as in my more humble, less illustrious case, one is informing the other and my documentary work definitely had a big influence on how I approached feature films. Having shot a feature, Man on Wire emerged out of that as a way of saying: Look, you can bring some of these dramatic ideas and ways of shooting mise en scéne, and using split screens, and some of the other things you can do in a documentary that wouldn't be normal. So even in my own case, I floated between both forms happily and never made a distinction in my own career between them. You're telling a story, and you're finding the best way of doing that with different strategies I guess for one or the other, but sometimes they overlap with the use of reconstruction and actors for drama. So yes, it's a very interesting question and I think there have been a few. Bart Layton's film American Animals (2018) is going to the point where you can sort of fuse the two, if you are taking a documentary type story, you're using the real people and indeed really good actors to kind of enlarge upon the spine of the testimony from the real people. I thought that was a very good film, actually, because it seems to be almost slightly nudging forward that idea. And he's not the first. I have done it myself, but I think he did it particularly well and took it a bit further than I had taken it. From King of Thieves' opening, the visuals have an energy by bringing the past to life. What we see is a movement from archival news footage to subjective and cinematic flashbacks of both the characters and the actors. One of the reasons that we did that -- and it was a cutting room strategy -- was that we are dealing with old men who move slowly, and so it felt you had to give the film some energy. They are very physically challenged and they all have their own infirmities, which dogs the whole project. So it was a way of acknowledging how they saw themselves, as they do. Villains these days do see themselves, I think, as somewhat characters in a movie, and there are some examples of that out there, particularly in American culture where people are embracing the screen version of themselves as they are committing crimes. There's a touch of that in King of Thieves for the real characters. We had access to transcripts of the secret recordings the police had made when they basically knew who had done it. They bugged pubs and cars, and we got transcripts of those conversations, and they sort of talk about how this should be a movie, that they are in a movie. So even these old men realised that there's a movie version of their lives running parallel in their fantasies to what they were actually doing. I felt that was another prompt to do that intercutting at certain points in the film, because this is how they saw themselves. And each one of them had a long criminal career and that was another way of flashing to these invocations of their past. It's sort of a personal mythology as criminals that was the thinking behind it, and which was actually quite pretentious. But it gives the film jolts of energy that I think it needed, and we very much told the true story for better or for worse. True stories don't often have these things that you can write in a fiction piece. What they have is the fact that they are true and you have to deal with those awkwardnesses, and with the details that you wouldn't write if you were writing a fiction version of it. So that was the thinking around it as we were working on it in the cutting room in particular, and at the very end we show you the younger versions of the actors. All of them have a mythology, and certainly in Britain they are very well known actors. We know about Michael Caine and what he's done, what he's known for, and likewise with each one of them. At the end it's a bitter sweet elegy for what they used to be, both as actors, and now in their older age. It's quite poignant to see the young Tom Courtenay and the young Michael Caine in their pomp and vigour, and now they are a little bit old and creaky. There 's a moral quandary with these types of films, in that we find ourselves rooting for the gang of criminals. It taps into how our morality and sympathies differ when watching a film compared to our real world moral sensibilities. You're getting to the heart of why we like these kinds of stories, because people act out things that we would never do, and you can invest in them. The great thing about cinema, and one of the reasons I love it so much, is that you can invest in a bad person's project. The great example that has come to me is what happens in Psycho (1960), when you're Janet Leigh, the protagonist of the film. You are with her and she has this huge moral dilemma; does she give the money back or does she not? You think: Oh, she should give that money back. It's on the bed and you see it, and Hitchcock circles around it. Then she steps into the shower, almost to cleanse herself, and at this point she's going to take the money back because that's sort of the gist of the film. And of course, within five minutes she is no longer with us. There's another protagonist and you immediately invest in this one who is cleaning up the mess of a character you have been invested in for the first half hour of [Psycho]. You're getting involved with the clean up and you're saying: "What's that spot of blood over there?" The classic example of that is at the end of the sequence, where the car is sinking into a swamp and it stops, and you are willing it to go down. So that's quite an extreme example of how, by investing in points of view and the character being given tasks, you begin to want them to succeed in those tasks even if they are appalling. Now in our case we're dealing with greedy old men who are all down on their luck. 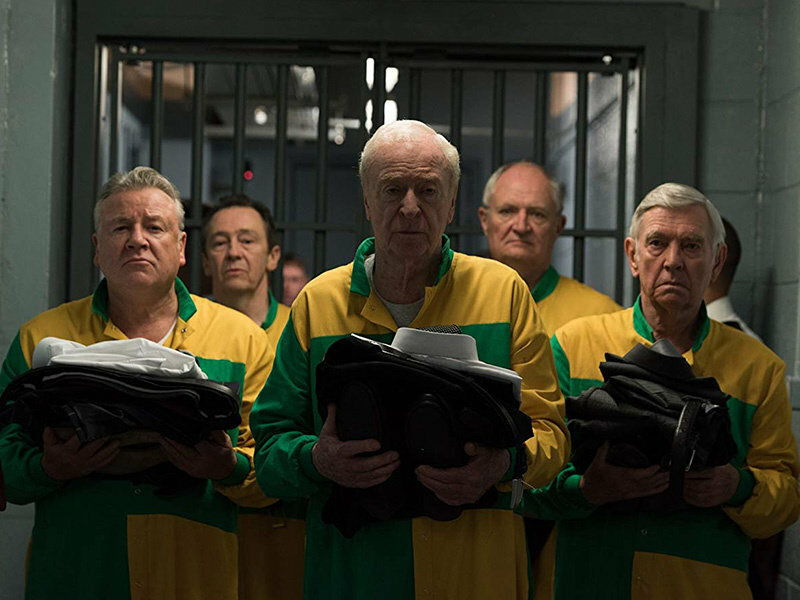 Aside from Brian Reader [Michael Caine], they all have good reasons to steal because they have no money, no pensions, and they're basically fucked as old men. They are out of the game in the twenty first century world that they don't really have much connection with. So I think it's quite easy to sympathise with them, and I hope you do to some extent, because you're seeing their point of view and their objectives, and you want them to succeed even though those objectives are criminal and immoral. The thing is, with this crime no one gets hurt. There's no shooting or coshing, or anything else. The main obstacles they have are themselves because they're old, and they've got to shoot themselves up with an insulin injection. That's the struggle as much as the vault and drilling a hole in the wall – can they physically overcome their shortcomings? And that's something that's very poignant, because we are all going to get old, and we are all going to have that issue at some point. I think there's an imaginative leap that you can make by saying it's difficult to get old and do this, and so you root for them a little bit for this reason, even if in the second half of the film they show their small-minded and back stabbing mentalities. Each of the characters have a stake in it all and when someone has something to lose, then they are going to fight for it and so that splinters them. It's a classic heist film in that regard, even though it's a true story. It has planning, cooperation and trust, and execution... You have to co-operate and collude, and trust to get it done, and when you have all got your hands on the loot, then it's every man for himself. This is the classic heist film, and it's very true in this story, and we know it to be true from the recordings we heard. So it all tracks with both the true story and the genre, which is quite pleasing. The French, American and British crime films all possess their own unique sense of feeling. But to specifically pick up on your point about the mythology of the actors, will this film play differently to an American audience than it will to a British audience? Oh certainly, I wouldn't know how and why, but absolutely. You've rightly discerned that each of those three cinematic traditions have their own versions of the crime film, and I'm thinking of [Jean-Pierre] Melville in particular. A film I watched with some of the crew before we shot was the French film Rififi (Jules Dassin, 1955), which is a great heist film. It's a classic, it's one of my favourites and we took a bit from that. At one point I was going to do a whole jazzy score, but we didn't end up doing that in the end, but that was a first thought I had about it, and that was based on that film and Lift to the Scaffold (aka, Elevator to the Gallows, Louis Malle, 1958). I'm not sure how the humour plays, which is often verbal, and it's also situational, and some of it's just pure slapstick, again based on things we know happened. We know that one of the guys did inject himself, he had to, and he did fall asleep because he hadn't [taken his insulin]. Some of the vulgarity of it is absolutely true and there's an incontinent character in this true story, and when the police arrest him they had to stop because he had to have a pee. All of this stuff is true and we just embraced it for better or for worse. So whether that plays the same I don't know, but each tradition, whether it's the French gangster film, the French heist film, or the British one, it has its own tropes and characters. But they also have a universality to them too, which is a bunch of men, or hopefully women in the twenty first century coming together with a common objective to steal something. Filmmaker Christoph Behl remarked to me: "You are evolving, and after the film, you are not the same person as you were before." Do you perceive there to be a transformative aspect to the creative process for you personally? Well it definitely changes you professionally, no question. Personally, it depends on the project. Certain films you absolutely feel different and you learn something, or something has changed within you because of what you've been doing. That's certainly true of a film I did called Project Nim, and it's definitely true of Man on Wire, and it's probably true of The Theory of Everything too that you feel you have learnt. But with every film you do professionally, absolutely you change. You make mistakes, you learn from them and sometimes you repeat your mistakes, and you get very mad at yourself: "I've done that again, I shouldn't have done that." This film was probably less personal; I didn't learn an enormous amount personally because it's not that type of story. I know that people [laughs] are greedy and stupid, or that greed can make people stupid because it's the oldest story there is -- love of money is the root of all evil. But professionally, this was actually a very fun film to shoot. They're not normally fun; you don't normally enjoy the twelve hour day, six day week, ten week schedule. It's normally a bit of a grind, to be honest, and you have to keep yourself motivated, but this one was curiously enjoyable. It has a great ensemble of people, actors and crew, who really enjoyed doing it. It doesn't mean the film is going to be good, there's no guarantee. You can have a miserable time making a film and yet it turns out really well. 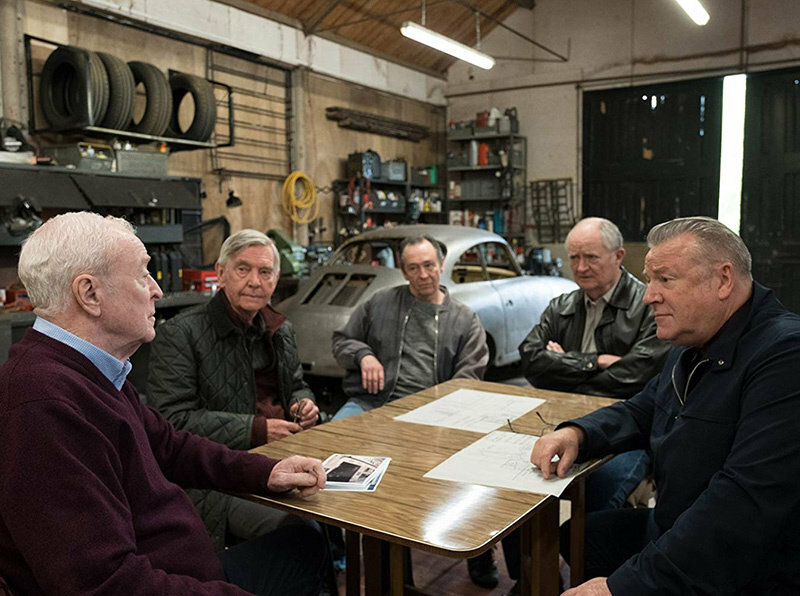 What I enjoyed about this film was the camaraderie of it, of being around these wise old actors that I revered from my childhood, and sitting and talking, between takes, about some of their previous work. They were very kind to me. It was a really good spirit that we did it in and everyone enjoyed coming to work. Ray Winstone would come on his off days to hang out on the set and that's an example of how nice this was, which was something I really valued. It doesn't have any impact on the filmmaking particularly, and it doesn't impede it, but at the same time it doesn't guarantee that you;re going to be successful. It's a very good question, and you're right to say that [films] should change you, either professionally or personally, because you've learned something that's invaluable. You will have made mistakes that are different from the mistakes you've made before, and you won't make them again. But as I pointed out, it's not usual to have the films change you personally, not unless it's a project like Project Nim, for example, that gets into such deep issues, and you have to think about things that you haven't thought about before. 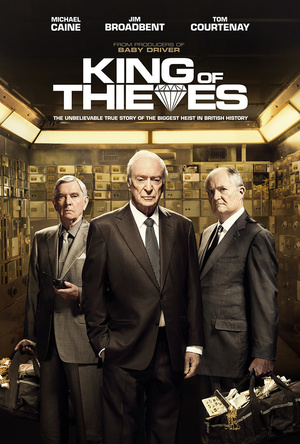 King of Thieves was released in US theaters and on VOD and Digital HD on 25 January 2019 by Saban Films, and is released on Digital Download, and on Blu-Ray and DVD in the UK by Studio Canal.